Genesis Streets of Rage 2 (USA) in 22:58.57 by Sonikkustar. 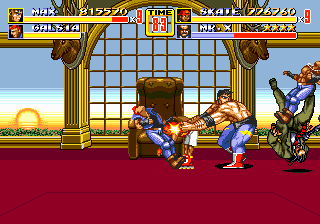 "Streets of Rage 2" is an excellent Beat-'Em-Up game with an extraordinary soundtrack composed by Yuzo Koshiro. This run is played with Max and Skate on Mania difficulty. The author, Sonikkustar, has discovered some new glitches and used 2 players to improve 4:56.96 over the previous run.